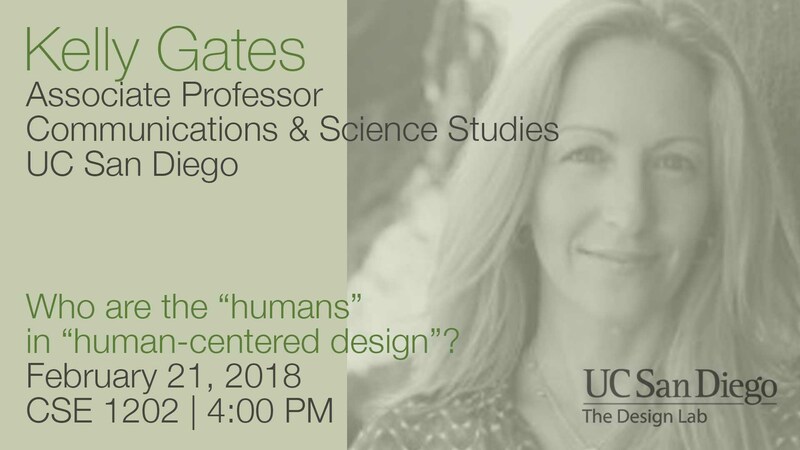 On Wednesday, February 21, 2018 at 4PM Associate Professor Kelly Gates (UCSD Department of Communication) will give a talk titled, “Who are the ‘humans’ in ‘human-centered design?” in the Design@Large series at UCSD. As most designers are aware, “human” is not a unified or stable category, and its plasticity has serious implications for design. It is not only that designers must be responsive to different bodies and their needs, but that design itself can shape and mutate bodies and subjectivities. To paraphrase the philosopher Langdon Winner, as societies invent new technologies, they also have to invent the kinds of people who will use them. This talk will consider what Katherine Hayles calls “technogenesis,” or the idea that humans and technics have co-evolved together, focusing on the mediatization of policing and forensics. Specifically, I will use three examples from my research as touch points for examining “technogenetic” relationships between humans beings and digital media: (1) the field of forensic video analysis, (2) the police body-worn camera phenomenon; and (3) the absence of data on people killed by police. These cases offer particular insights for understanding what is made visible and invisible by the design of media systems, including automated forms of vision and visual analysis. Kelly Gates is an Associate Professor in the Department of Communication and the Science Studies Program at University of California, San Diego. She specializes in the study of surveillance, digital media, and visual culture, from an analytical perspective that bridges science and technology studies and cultural and media studies. Her first book, Our Biometric Future: Facial Recognition Technology and the Culture of Surveillance (NYU Press, 2011) is a critical-cultural study of the automation of facial recognition and facial expression analysis, focusing on the applications of these experimental technologies in policing, security, social media, and the measurement of emotion. In her current research, Gates is investigating the emerging professional field of forensic video analysis, looking at the ways in which new visual imaging and archiving technologies are being incorporated into, and transforming modern investigatory and evidentiary practices.